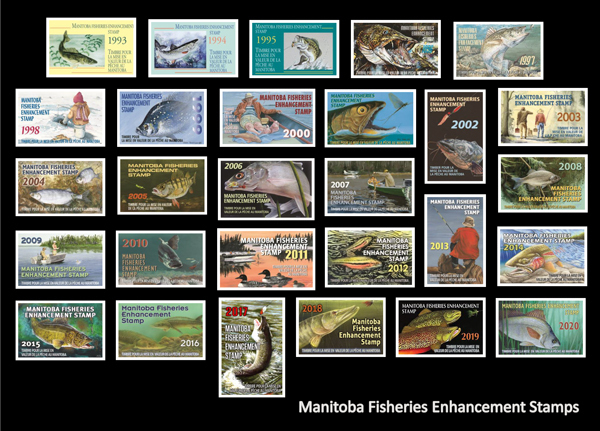 In 1993, Manitoba Fisheries Branch commissioned the first Fisheries Enhancement Stamp. Artist, Judy McInnes’s painting, “Manitoba Walleye”, was reproduced onto every angling licence sold. Since 1994, artists have been entering the annual Fisheries Enhancement Stamp Artwork competition. What started as painting submissions only has expanded to include woodcarvings, sculptures and more. Winners have their artwork reproduced on angling licenses, as limited edition prints and stamps, and used in promotional material. Subject matter has been selected for 2020, 2021, and 2022 competitions and is limited to artwork depicting the following species: Freshwater Drum (2020), Arctic Char (2021) and Channel Catfish (2022). Deadline date for submission of entry form is the first Friday in July of the competitions respective year; the deadline date for submission of artwork is the first Friday in August of the competitions respective year. Anyone interested in purchasing prints of the artwork can do so by noting the artist’s name, artwork title and year indicated on each piece and emailing FWEF@gov.mb.ca or calling 204-945-5156. The original Fisheries Enhancement Initiative (FEI) was established in 1992 by a 1993 licence fee increase of $2.50 per licence on angling licences. The fund was established to improve fish populations and fish habitat in Manitoba. Fish Enhancement Initiatives included projects based on conservation, enhancement, communication and education. From 1993-2007, $350,000 was available annually for fisheries enhancement initiatives. In 2008, a further $3.00 angling fee increase was added and the formation of the Fisheries Enhancement Fund (FEF) was created. Funding levels were increased to $600,000, a broader range of projects could be funded and a Project Review Committee consisting of members of seven angling groups was implemented with the FEF. A further increase in funding was granted in 2008, which made available $850,000 for Fisheries Enhancement Initiatives. On March 1, 2014, the Fish and Wildlife Enhancement Fund (FWEF) was established under authority of The Fish and Wildlife Enhancement Fund Act (initially Bill 13, and now C.C.S.M. c. F87) and its regulation (57/2014). Ten dollars ($10) dollars from every angling licence sold will be directed into the Fisheries Enhancement Fund. Five ($5) from every hunting and trapping licence sold will be directed into the Wildlife Enhancement Fund. Sustainable Development (SD) administers this Fund for the purpose of supporting fish and wildlife initiatives, including projects, programs and studies designed to protect and increase fish and wildlife habitats and populations in Manitoba, and government fish hatcheries. Two subcommittees are established to make recommendations on the funding of enhancement initiatives. The Fisheries Enhancement Subcommittee reviews and makes recommendations on all fisheries enhancement initiatives that seek funding and recommend initiatives to be funded. The Wildlife Enhancement Subcommittee reviews and makes recommendations on all wildlife enhancement initiatives that seek funding and recommend initiatives to be funded. the acquisition, by purchase, lease or other means, of property or an interest in property in order to protect a critical fish habitat. the acquisition, by purchase, lease or other means, of property or an interest in property in order to protect a critical wildlife habitat. Applications for Fish Enhancement Initiatives are now being accepted. The next intake deadline date is September 3, 2019; the following intake deadline date is March 1; the following intake deadline date is September 1. *Please note that FWEF - Fisheries Enhancement Subcommittee reserves the right to allocate funds in any given year as angling licence revenue becomes available. **Any application that involves the funding of a boat ramp, a boat dock or any related amenities (for example, a fileting area, a picnic area, etc.) will not be considered or recommended for funding, as such work does not satisfy the definition of “Fish Enhancement Initiative” in The Fish and Wildlife Enhancement Fund Act. *Please note that FWEF - Wildlife Enhancement Subcommittee reserves the right to allocate funds in any given year as hunting and trapping licence revenue becomes available.